Of course, our friend JohnBrown is not exactly historically important enough to warrant a page on CTMQ. THIS John Brown actually warrants two pages… Because I just decided that. Note, both pages are exactly the same, but I felt that in addition to being on the CT Freedom Trail, I should note this spot in the “Memorials and Monuments” section as well. You understand. John Brown is one of those iconic guys in American history that almost everyone with a high school degree has at least heard of. Of course, he’s far more associated with Kansas and West Virginia than with Connecticut, but we’re used to that – Mark Twain Missouri what? Samuel Colt “the West” where? Glenn Beck Nuthouse what? In Brown’s case, however, his association with Connecticut really wasn’t that strong. He was pretty much just born here. In the middle of nowhere in northern Torrington, almost in Goshen for crying out loud, along a road that probably hasn’t changed too much from his birth year of 1800. As Hoang and I poked around the spot, which now only contains a stone monument and some foundation, I did feel a sense of importance. John Brown was perhaps a bit of a nut (with the “mission from God stuff and voices in his head), but he was the most noble nut of all. And I love him for it. Today, there is little visible evidence of the house where the fiery abolitionist, John Brown was born. Nevertheless, the site remains a compelling place to visit and contemplate events in the life of John Brown, whose actions have so profoundly shaped the history of America. 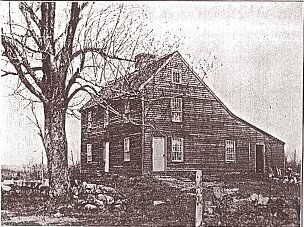 The farm house was built in 1785 and was purchased by Owen Brown, John Brown’s father, in 1799. John Brown was born there on May 9, 1800. 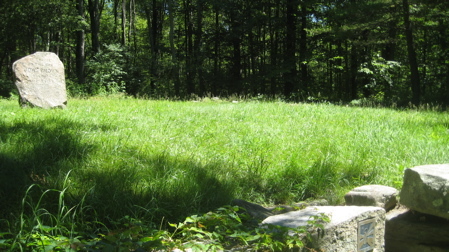 Since 1918, the site has been maintained as a clearing in the forest. 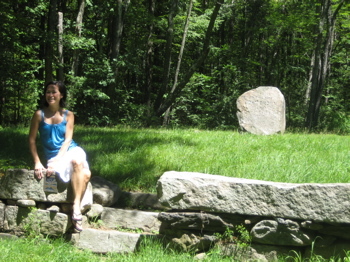 In 1932 a granite monument was erected. 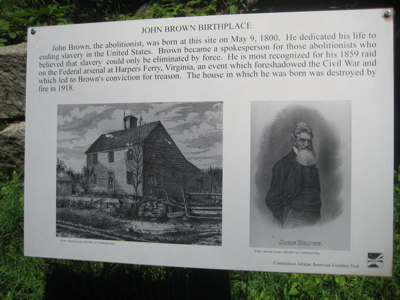 Further historical recognition was secured in 1997 when the birthplace of John Brown became a Connecticut African-American Freedom Trail Site. 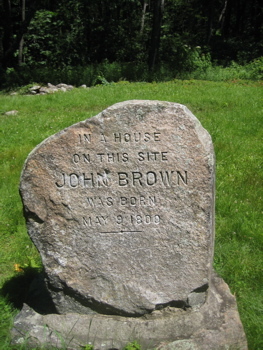 In the year 2000, the Torrington Historical Society acquired the property in merger with the John Brown Association. Plans are now being formulated to improve visitor services and to construct interpretive trails on the property. I asked someone how that last bit is coming along and was told that there is nothing in the works (July 2010). Oh well, maybe someday. UConn’s Torrington branch is less than a mile away through the woods to the northeast and I could hope for some sort of partnership there as well. 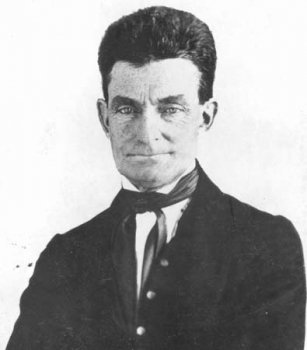 Of all the sons and daughters ever born on Connecticut soil, perhaps no one has exerted a more profound impact on the nation’s history than John Brown. Born high atop the scenic hills of Torrington, the future abolitionist spent the first years of his life imbibing the stern rigors of his father’s old-line Calvinism. Though he soon moved west and for years was plagued by a series of disastrous business ventures, he never abandoned his faith. Indeed, emerging from the 2nd Great Awakening of the early decades of the 19th century as an evangelical Protestant, he eventually dedicated his life to eradicating what he deemed to be American’s greatest sin – the enslavement of human beings. Enlisting in the burgeoning abolitionist crusade of the 1830s, Brown initially hoped that slave owners might see the error of their ways through “moral suasion.” Still, like many other abolitionists, he warned that if southerners failed to emancipate their slaves voluntarily, an angry God would reap His revenge against the nation via a bloody civil war. When his plans to distribute guns to slaves to launch a guerrilla war failed, he was captured, tried, convicted of treason, and sentenced to death. Interestingly, Brown seemed to relish his notoriety and perhaps understood that his martyrdom might well bring the nation closer to a civil war that could end in the demise of slavery. At any rate, what is certain is that Brown’s daring actions sent shock waves throughout the country. In the North, he was hailed by many as a hero and Ralph Waldo Emerson predicted that Brown “would make the gallows as glorious as the cross.” In the South, however, he was viewed by most as a typical abolitionist who wanted nothing less than a major slave insurrection. In all, John Brown was indeed “the meteor” who succeeded in polarizing emotions and elevating southern anxieties into a “crisis of fear” that set the stage for the impending Civil War. Good stuff, but they left out the best part: His righteous murders in Kansas! From a bio of Brown: By the time he was 50, Brown was entranced by visions of slave uprisings, during which racists paid horribly for their sins, and he came to regard himself as commissioned by God to make that vision a reality. In Aug. 1855 he followed 5 of his sons to Kansas to help make the state a haven for anti-slavery settlers. The following year, his hostility toward slave-staters exploded after they burned and pillaged the free-state community of Lawrence. Having organized a militia unit within his Osawatomie River colony, Brown led it on a mission of revenge. On the evening of 23 May 1856, he and 6 followers, including 4 of his sons, visited the homes of pro-slavery men along Pottawatomie Creek, dragged their unarmed inhabitants into the night, and hacked them to death with long-edged swords. Come on Torrington Historical Society! Don’t ignore the his swashbuckling antics! Anyway, despite his penchant for supernaturalism and murder (the two are so often intertwined), John Brown was a very important guy. I’m glad that his birthplace plot of land is now protected and will serve future generations. Three facts I did not know. Though, it would be good to mention CTMQ’s visit to the Canton Historical Museum.